I start off by cleaning the main spring, putting it back in and oiling it. Bottom plate ready for the dial. Movement goes into the case. A very nice looking watch indeed – especially considering the price. If you consider value for money, this is a great bargain watch. The movement is well made, and the watch looks good. 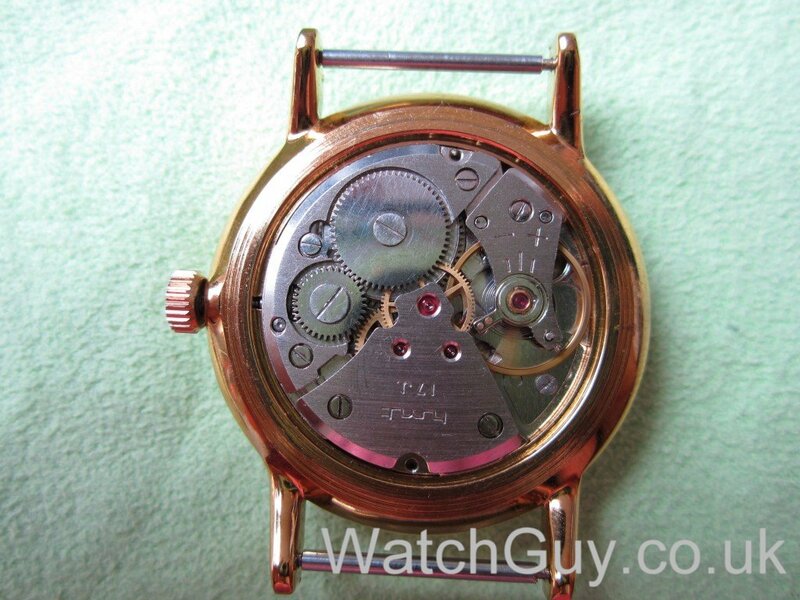 One of my sons has an HMT Janata (the other one an Accurist), and this is a great watch as a first mechanical watch. If it gets lost or damaged, no huge harm done. These go on eBay for around £20. This entry was posted in Indian, Wrist Watches by Christian. Bookmark the permalink. Thank you for your two articles on this piece. I was still wondering though how you can open and close the case back. Any ideas ? Try a small inflatable rubber ball. Now i want to refuebish this watch. Where a can change the dial and which other classic variety sutes these models. Is this design from Citizen or its HMT own. 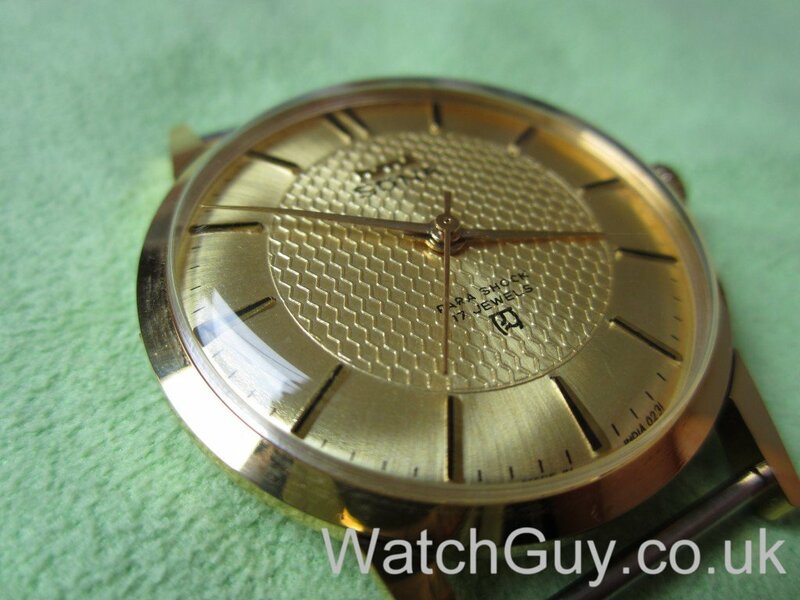 I have a HMT gold plated watch and I have to agree that it’s superb value. It cost me £5.12 on ebay and only gains a minute a day, whilst looking good. 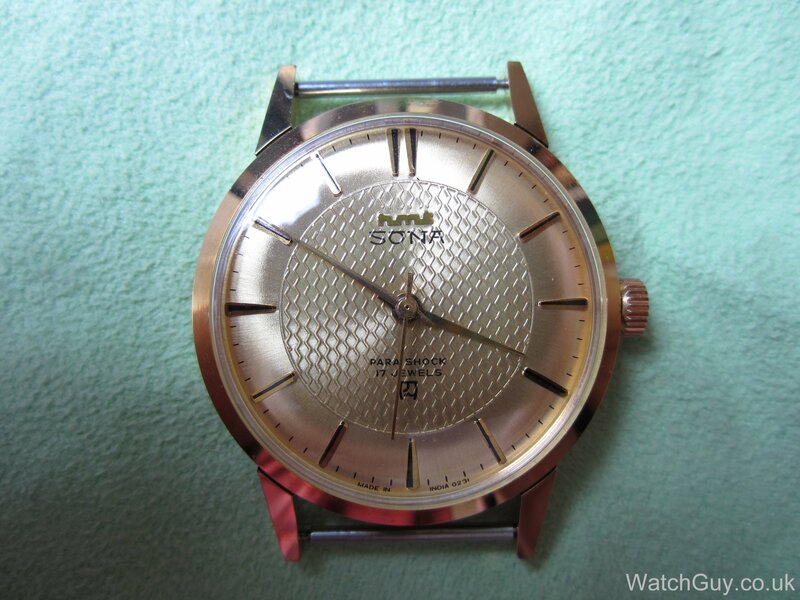 I was handed down an HMT Sona watch by my late father. It has a lot of sentimental value to me. The watch is not working anymore. Can anyone recommend where I can get it repaired in Bangalore? I’m afraid I don’t know any watchmakers in Bangalore. Sorry that I can’t be of help. 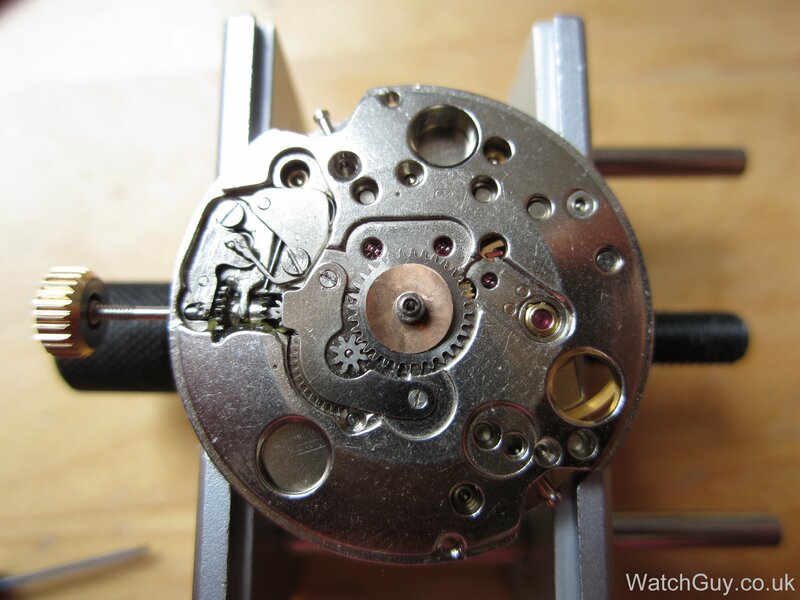 Give to any watch mechanics in MG road , majestic or commercial street , they will repair it for you or they even can replace the 0231 movement for it . But check the charges first !. HMT watches are the best. I have a HMT Rajat bought way back in 1976 for Rs. 462 after waiting for over three months. It is an automatic watch with black dial and red markers and hands. Day and Date too. After 38 years and probably servicing it thrice till date, it keeps great time. Plus one minute a day. A marvel and cute looking. Over the years, I have collected hand winding watches like HMT Janata, Pilot, Sona, Kohinoor and Sachin. All keep great time. 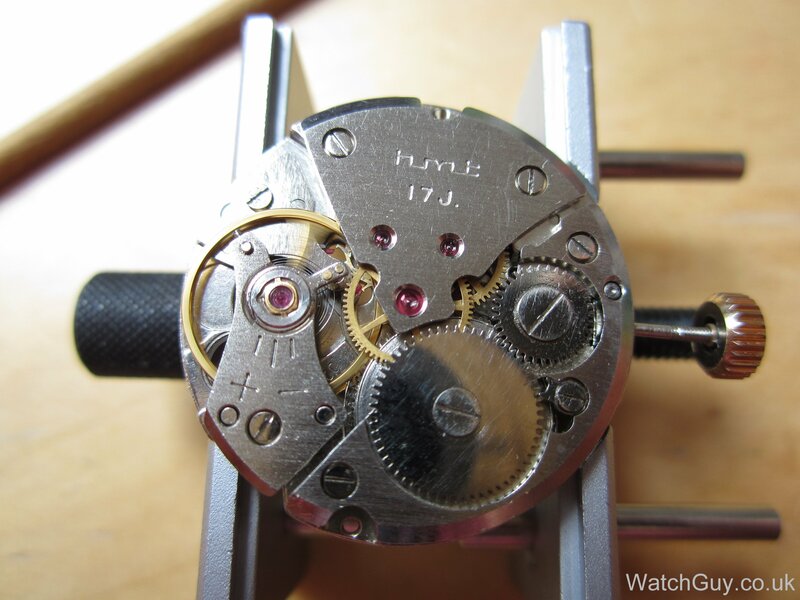 The best part is GP cases of HMT are made in pure Brass. All you need to make it shine is apply Brasso. No problem of becoming black like TITAN or Dull like other GP watches made of SS cases. Great watches at great prices. Sad to see the company closing down. I’ve just broken the crystal on my HMT Janata (in fact, the crystal was in several pieces on the kitchen floor). I have a new crystal on its way from India. I don’t have any equipment or expertise. Will I need to take it to a watch specialist or can I fit a new crystal at home? Will it go in by hand? You can buy the tool you need on eBay – it’s called a crytal lift. Those who are buying HMT watches from Indian buyers in ebay should be careful. Some of these sellerssay the watches are new and unused but they are in fact used and refurbished watches. They charge nearly $50 but used HMT watches could be bought for around $15 to $20. HMT does not make most of these models any more. I am buying a HMT pilot LE. I hope the watch to be serving fine for years. 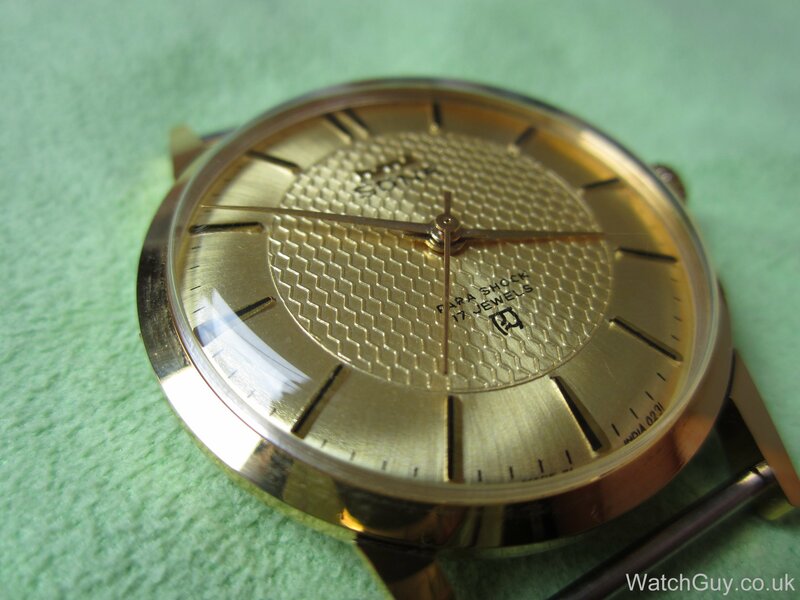 Christian – a question – I have a Tissot Visodate of mid 1960s bought from Italy by my father’s elder sister. this watch was used till 15 years back regularly. he gave it to repair at a local shop in Muvattupuzha town,India and he messed up damaging some wheel or spring. I want this watch to be repaired at minimum cost as repairing a Tissot mechanical watch means a large sum in India I presume. do you have any suggestions if I carry the watch to LA,USA whether this watch can be repaired fully OR if this watch can be repaired in India. 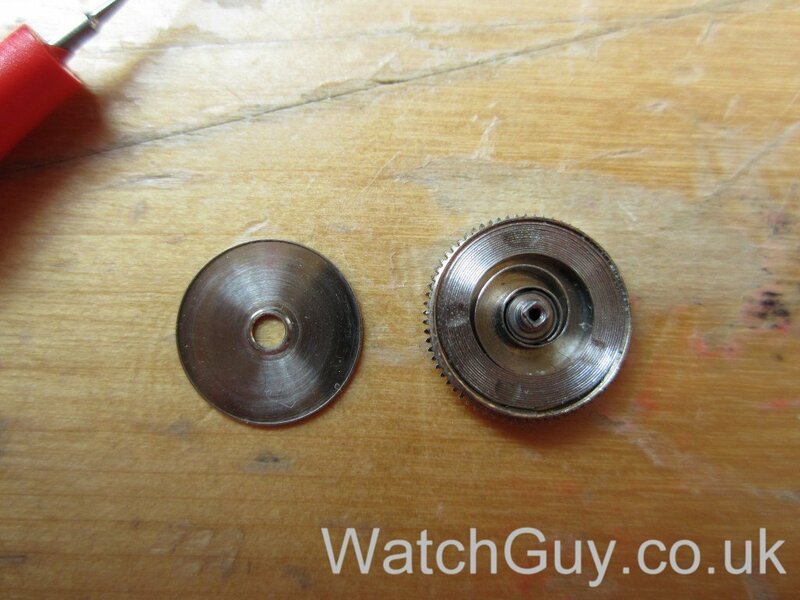 Anyone with the right knowledge and the parts can fix your watch, whatever continent he or she is on. If you don’t want to pay the right money, you will get the wrong repair. I own an old HMT Kajal Deluxe Automatic 21 Jewel wrist watch. Inside it says “HMT 21 Jewels and a number 8205” The Dial says “HMT Kajal Deluxe and 21 Jewels.” The dial is kind of Golden. 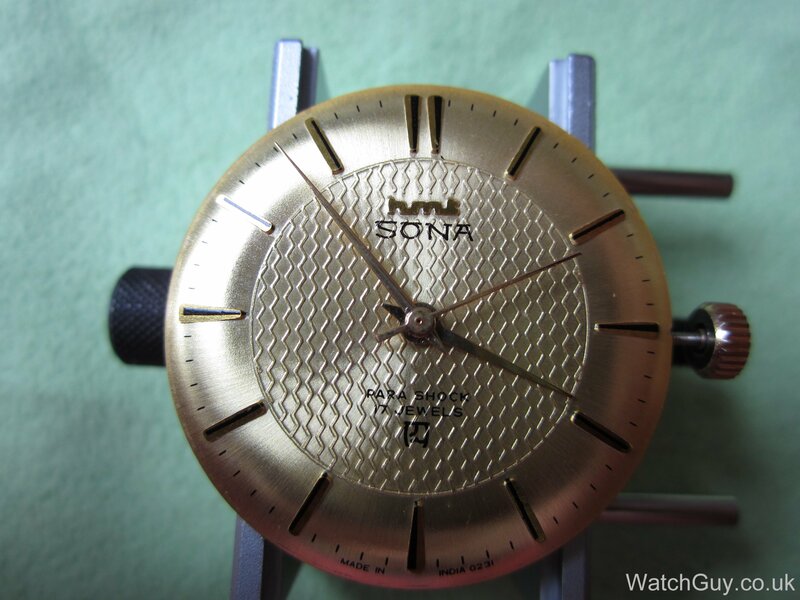 I think it is probably original as it does not appear to have been repainted – there are clear flaws in the dial – not much, but they are present as such it is “probably” original. It looks good – flaws are small and not really noticed unless you are using a magnifier – I am! Back Says “Stainless Steel, Shock Resistant, Water Resistant and HMT 650187.” The case is clearly stainless steel – well polished! The crown is just well… a crown – no marking on it. Original? I do not know! I suspect the crystal not to be original as it is not scratched up at all! It is not glass – nor does it seem to be plastic! I don’t know what it is. It looks good! Day, Date and time functions all work – all hands move! Setting functions work. 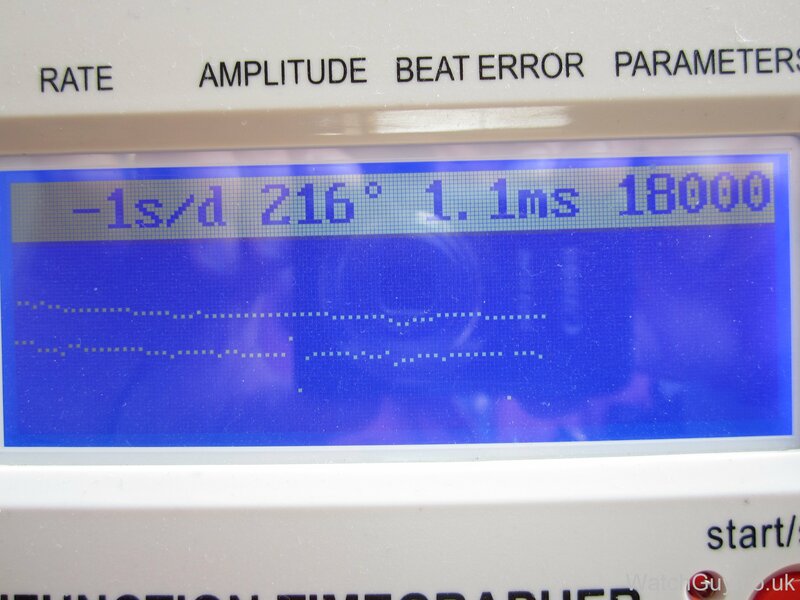 Accuracy “appears to be off +/- a minute or so a day! 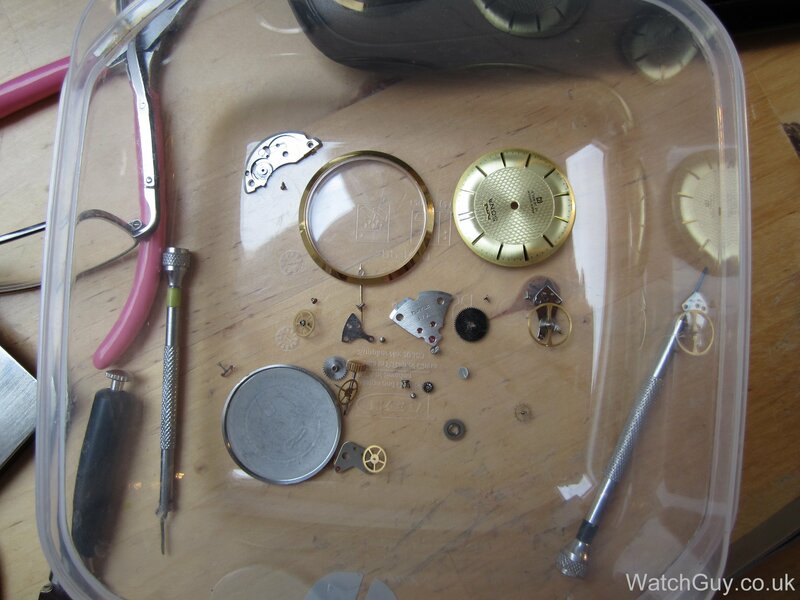 I will not attempt to correct this minor an error on what seems to be an old watch – automatic / mechanical. AKA/ not the abomination of “Quartz” Bah Humbug! I would rather not know what day, date or time it is if I must wear a Quartz! 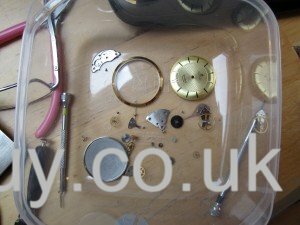 SO!… Is this watch an original HMT / Vintage semi collectors type example of a good, cheap and well designed / built watch? Is there a way to tell for sure? Or, do I have a watch that is actually several watches pieced together to look, feel and sound like a Vintage Kajal Deluxe? What is my watch worth in Dollars USA? Additionally; what is with the 15 Cent Chinese Leather (?) Watch Band? I would not give this away to one of my customers as I have zero desire to insult him / her and loose their future business. Better no band at all! Or; give them a Stainless Steel Band. They can be had (both straight and curved ends) for $5.99 – shipping included! This at the least looks presentable as it’s for a watch – not a collar for a rat! Where have all those original stainless steel bands gone anyway? Are they being hoarded by some nut? It’s a Cheap Band for a Cheap Watch! Let my Original Stainless Steel Watch Bands go! Folks, appreciate your patience in understanding “The Timekeeper of the Nation” for India. Since 1961, HMT has been a name synonymous to Bajaj Scooters and DoorDarshan (the Government TV Channel). Outmarketed, due to product innovation and marketing, HMT lost it’s Market Share over a couple of decades ago. But whoever owned an HMT (mostly the Hand-Wound or Automatic watches), still swears by the reliability and ruggedness. Such is the “appeal” of the HMT hand-wound watches, even today.. Truly, the “Timekeeper of the Nation”!!!! Nilanjan, consider yourself lucky if you can lay your hands on a HMT Sona or a Janata. Both are classics like the Pilot. All HMT showrooms have exhausted their stocks of these models especially after the announcement of the closure of the company. Whatever stocks was available has been taken by online marketing companies and they are selling the same at a fortune. I have purchased the above models last year in one of their showroom for Rs. 1200 less 20% discount. Once you wear a HMT, you will fall in love with these watches as they have their own special appeal which none of these cheap Chinese battery operated movements fitted inside all the watches made in India and abroad offer. Buy any mechanical HMT watch, hand winding or automatic available anywhere. Wish you all the best. Great job in restoring it! Looks nice. I too own a Janatha and a Sona. Both use the same 231A movement. These models are still in production and sold by HMT Watches. Incidentally HMT stands for Hindustan Machine Tools, the full name of the company. It is Government enterprise started in the 60s, if I am right. They had a technology transfer agreement with Citizen of Japan. Their first model was named Janatha, which in Hindi means ‘people’ or ‘citizen’, the name of the Japanese company. HMT was slow on adopting to changing technology when a major shift happened from mechanical watches to quartz movements. So they lost their market to Titan, the major competitor at that time. Now they are trying to catch up. But it rather an uphill task. Coming back, their mechanical movements are getting exported in small ways and their winding and automatic watches are still in demand with connoisseurs of old worldly, with a life time of reliability, kind of watches. Link to HMT Watches is http://www.hmtwatches.in/. Link to mechanical watches, including Sona, can be found here: http://www.hmtwatches.in/18/collection/mechanical.html. Incidentally, Sona in Hindi means Gold. The watch continues to sport a high quality gold plating on the case. As regards the dial, there are two variants, one gold and another White. The latter one is striking. These days some kind of ‘sale’ is happening with a 20% discount on marked price. So at Rs 1000, which converts to about USD 19, you can get a brand new, charming old worldly amazing mechanical hand wound watch, virtually for a song! And there are dealers who may even mail to overseas addresses, but the mailing cost may be more than the cost of the watch itself, sadly. Thank you for all the information and links – much appreciated! I bought my Sona in 1971. Still working! No battery. No expenses. Citizen did transfer knowhow to hmt. But the watch was indeed made in India. Your best bet is eBay. Very nice and interesting. Great photos too! Both my girlfriend and me have the Sona and we love it. Glad you got that fixed. I was disappointed to see it broken a few weeks back. I agree with you about the value for money angle of these watches. I just got a new HMT Pilot on Ebay for £19.99. Same movement as your Sona, in a stainless steel case with a black dial and silver hands. It had a strap that would have cost £10 on its own. It has a nice loud tick, and runs to within a daily rate of +18 seconds so far when on the wrist. A great bargain for a nice nostalgic style of watch. I have no doubt it will tick away for decades.